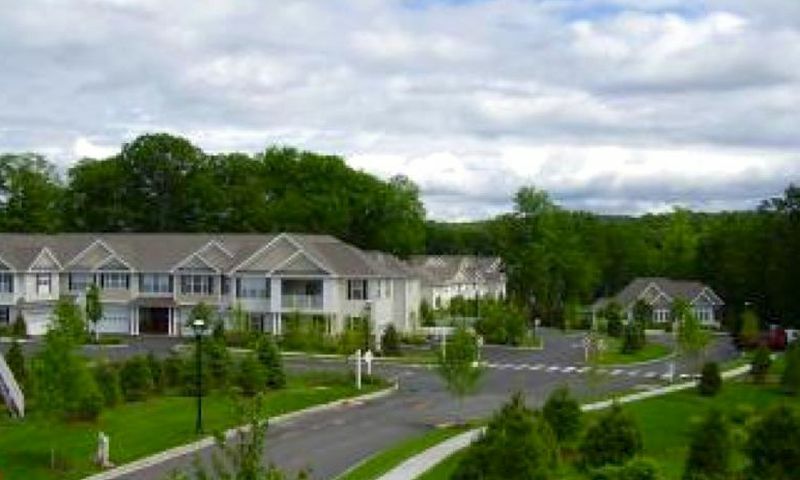 Liberty at Newtown in Newtown, Connecticut is a community for active adults in upscale Fairfield County. This thoughtfully designed development offers the luxury, amenities and low-maintenance lifestyle that discerning homebuyers expect. Liberty at Newtown was built by GDC, a renowned Westchester development company. Liberty at Newtown has been designed to preserve the stunning beauty of its natural surroundings. Boulder and stone retaining walls protect mature trees and residences incorporate dramatic architectural features and landscaping that harmonizes with the natural topography. In addition to the lovely wooded trails that beckon residents to stroll the grounds, Liberty at Newtown features an elegant community clubhouse complete with a fitness center, library and multi-purpose room where residents gather together or host private events. The outdoor amenities include a pool and spa, spacious patio, and a practice putting green area. Active adults can enjoy the beautiful surroundings by taking scenic strolls along the walking and biking trails. Liberty at Newtown's lushly landscaped grounds lead to 96 attached residences that offer the latest in kitchen cabinetry and appliances, luxurious master baths, and an abundance of closets and storage space. Homes in Liberty at Newtown features two or three bedrooms, two or two-and-a-half elegant spa-style bathrooms, spacious walk-in closets, and a private two-car garage. These attached homes offer 1,650 to a little over 2,408 square feet of living space and have been carefully designed with active adults in mind to provide a low-maintenance lifestyle. The residences at Liberty incorporate the design features of a fine manor home with the best of modern conveniences. Traditional exterior finishes of stone, clapboard and shingle siding with bays and gables reflect the quality and details of a New England country estate. Residents enjoy life to the fullest because the homeowners' association fee includes maintenance of the landscape, driveway, sidewalk, and home exteriors. Nature and daily life go hand in hand at Liberty at Newtown. Varieties of native trees and shrubs, many that have graced the land for a century, still thrive on the property. Over 30 acres of permanently protected open space provide a backdrop for New England's four-season show. Residents have front-row seats to catch the buds bursting with light pink and fuchsia in spring and the resplendent hews of yellow, orange and red in the fall. Newtown, a picturesque town in southwestern Connecticut was founded in 1705. This scenic town is bordered on the south by Easton and Redding, on the north by Bridgewater and Southbury, on the east by Oxford and Monroe, and on the west by Bethel and Brookfield. About 45 minutes east of Liberty at Newtown is New Haven, home to Yale University and some of the best pizza in the country. Active adults can enjoy living a maintenance-free lifestyle with clubhouse amenities in Liberty at Newtown in Fairfield County, CT. There are plenty of activities available in Liberty at Newtown. Here is a sample of some of the clubs, activities and classes offered here. Homes in Liberty at Newtown features two or three bedrooms, two or two-and-a-half elegant spa-style bathrooms, spacious walk-in closets, and a private two-car garage. These attached homes offer 1,650 to a little over 2,408 square feet of living space and have been carefully designed with active adults in mind to provide a low-maintenance lifestyle. Please Note: Not all floor plans are available at this time. Liberty Newton is a very nice little neighborhood. It's surrounded by nice landscaping and lots of trees so it feels very scenic. The homes are very well done and the clubhouse has everything we need. The equipment in the fitness center is great and well maintained, we've got a nice little putting green too and the pool is lovely too. The homeowners all help each other out and are very nice. 55places.com is not affiliated with the developer(s) or homeowners association of Liberty at Newtown. The information you submit is distributed to a 55places.com Partner Agent, who is a licensed real estate agent. The information regarding Liberty at Newtown has not been verified or approved by the developer or homeowners association. Please verify all information prior to purchasing. 55places.com is not responsible for any errors regarding the information displayed on this website.